The Harbinger Ergo grip strength system is uniquely designed for fast and efficient whole hand and individual finger strength building at home or on the go. 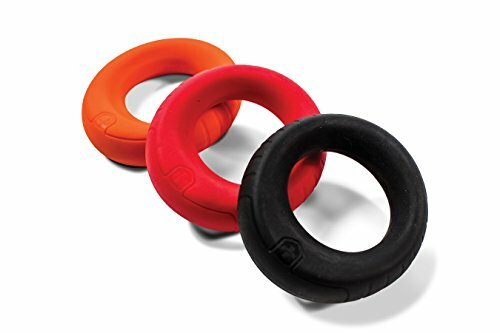 The ergonomic donut shape fits the natural shape of the hand, minimizing the risk of dropping the grips, and silicone provides a secure, non-slip surface for excellent control while strengthening the hands and fingers. The shape is designed to accommodate a range of hand sizes and work well for both men and women. The grips are lightweight and convenient for travel and are also easy to clean. With no springs or sharp parts and made from nontoxic silicone, they are very safe to use, even in homes with small children or pets. The Ergo grip strength system comes with three grips in different resistance levels, each a different, vibrant color. As hand and finger strength improves, progress from the 20-pound resistance grip to 40 and then 60 pounds of resistance. If you have any questions about this product by Harbinger, contact us by completing and submitting the form below. If you are looking for a specif part number, please include it with your message.